CHEMISTRY may not have been anyone's favorite subject in high school, but in the bars and clubs scene, chemistrythe brainy branch of natural science and the horny branch of pheromonesrules. Whether it's the composition of substances (the liquid kind, please) and their properties and reactions, or the availability of hotties and their properties and reactions, chemistry reigns as the most fun ongoing experiment in the laboratories of Silicon Valley's social scene. Once again this year, we at Metro have donned our lab coats and subjected the valley's houses of inebriation to rigorous testing. Our team of writers has visited every one of the places you see in these pages, testing the strength of drinks, measuring the padding on bar stools, administering personality tests to bartenders and weighing the bowls of pretzels. 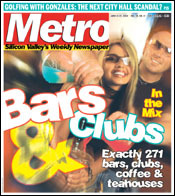 The result is our most comprehensive, most scientifically accurate guide to Bars and Clubs ever. The numbers don't lie; somewhere in these 271 bars and clubs, coffeehouses and teahouses is the place for you, the social haven where all elements add up to that perfect alchemy of comfort and stimulation. And the odds of finding the right chemistry in Silicon Valley seem to have improved over the past year, with hot spots like Vbar, Straits Restaurant, Blowfish Sushi to Die For, the Blue Tattoo, Seven Restaurant and Lounge, Forbes Mill Steakhouse and the Elixir Lounge at South First Billiards mixing up the scene. Add favorites like Zoë, the Blank Club, the Cardiff Lounge, Hukilau, Forum Restaurant and Nightclub and others too numerous to list, and things seem positively explosive. Downtown's upscale efforts have gotten a boost with Club Palermo, Blue Monkey, Glo and the soon-to-open (July 23) Pete Escovedo's Latin Jazz Club. Safety glasses may be in order. Writers: Avital Binshtock, Michael S. Gant, Jim Harrington, Najeeb Hasan, William Dean Hinton, Todd Inoue, Christine Lee, Sarah Quelland, Aaron Robinson, Gary Singh, Anneke Swinehart, Joe Tone, Traci Vogel, Gordon Young. Photographs: Dave Lepori. On the cover: Chantell Robert and Greg Grimm of Zoë's Back Bar.